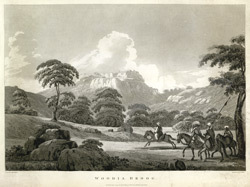 This uncoloured aquatint is taken from plate 7 of Captain Alexander Allan's 'Views in the Mysore Country'. Allan described Hudedurg as "a hill-fort commanding the head of a pass of the same name (sometimes called Policode Pass, from a town of that name at the foot of it) being the principal pass into the low countries, and the same through which Haider descended in 1780, was evacuated by the enemy on the approach of the army and occupied on 22nd July 1791 by a British garrison, in whose possession it remained until restored to Tippoo by the treaty of Seringapatam." The pictures of the Mysore region by Captain Allan and fellow amateur artists such as Colebrooke were eagerly consumed by a British public, upon whom the drama of Seringapatam and Tipu had made a strong impression. They influenced other artists whose imaginings of Mysore relied on the sketches of those who had been there.